The days when I was spiking my hair, sporting a Casualties’ shirt and shouting “Oi! Oi! Oi!” at punk-rock shows are long gone, though I’m still playing some good old The Oppressed, Cockney Rejects or Los Fastidios tunes from time to time. So it was a nice surprise to receive this LP for a review. “Soundtrack Out Of The Box” is a split LP coming from two antifascist streetpunk/oi bands based in the Carpathian region of Czech Republic and Slovakia. RozpoR is the more familiar band to me since I’ve seen them live few years ago in Slovakia and they’ve got a really impressive discography on their backs. Here they are rocking with 6 new songs of their street rock’n’roll. There’s a definite Motörhead touch in their music, alongside the typical British Oi! influence, while the lyrics are all in Slovakian language and unsurprisingly deal with the love/hate affairs with punk-rock and politics. On the other side we have 8 songs of Zlá Krev (Evil Blood) from Moravia, Czech Republic. Their music is much faster and dynamic, they’re also more political in their lyrical content. All I can say is this is pretty straight-forward streetpunk reminiscent to the sound that originally got me into DIY punk. 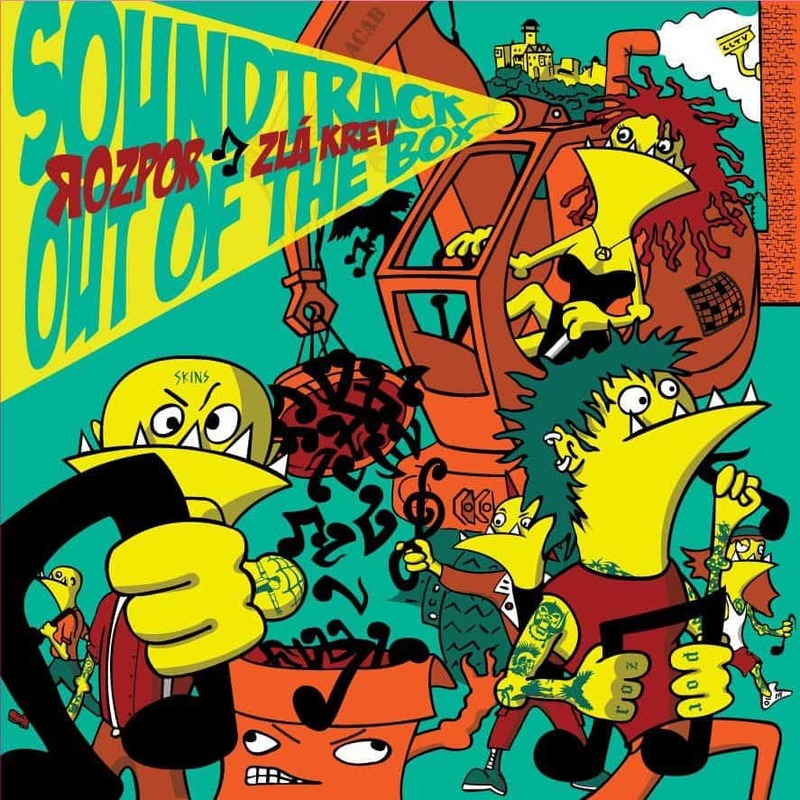 The sound is very clean and the packaging is really cool, there are English translations to all the songs and in addition to the colored vinyl and the funny cartoon-style artwork the LP also comes with a full-color cartoon poster depicting a punk with a mohawk smashing the head of a probably Neo-Nazi skinhead. There are no labels involved and it’s all done by the bands themselves, thanks to their passion for punk-rock and DIY subculture.